The Eleventh Tai Situpa, during his visit to Bhutan, in 1936. Palpung Situ Pema Wangchok Gyalpo (Tib. པདྨ་དབང་མཆོག་རྒྱལ་པོ, Wyl. 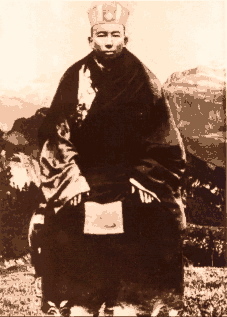 pad ma dbang mchog rgyal po), the Eleventh Tai Situpa (1886-1952) — recognized at the age of four as the reincarnation of the previous Tai Situ by the Fifteenth Karmapa, Khakhyap Dorje, Palpung Situ Pema Wangchok Gyalpo was then enthroned at Palpung Monastery. He received ordination and teachings from Khakhyap Dorje, as well as teachings and empowerments from Jamgön Kongtrul Lodrö Thayé. He was also one of Khenpo Shenga's main students. Situ Rinpoche later recognized the Sixteenth Gyalwa Karmapa, Rangjung Rigpé Dorje, and performed his enthronement and ordination. He transmitted the complete teachings to him and bestowed all the initiations, explanations and empowerments. Palpung Situ Pema Wangchok Gyalpo was also one of the main teachers of the Second Jamgön Kongtrul Rinpoche, Karsé Kongtrul. At about the age of fifty he visited the great Surmang Monastery, and performed many miracles. He passed the rest of his life partly in meditation and partly giving teachings to his many disciples. At the age of 67 he passed away amidst many auspicious signs. This page was last edited on 26 March 2011, at 15:09.